The O'Reilly Velocity Conference, Santa Clara, California - The average website is based on an overestimation regarding its capability to handle visitors by 3.4 times. This is shown in the report The State of Web Readiness 2012, drawing on data about load testing habits in 132 different countries compiled by Load Impact, the worlds largest online, cloud-based load testing service. The report also shows that e-commerce sites tend to be more concerned with being able to handle traffic peaks than other websites. 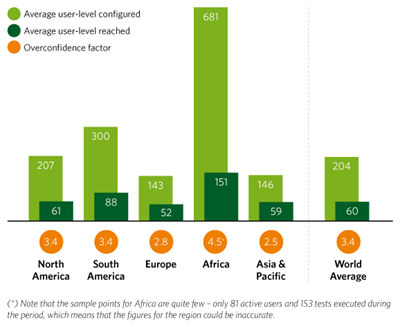 The report analyzes data from 8,522 load tests executed in 132 different countries. The tested sites range from government organizations that have to be prepared for emergencies and e-retailers who need to cope with seasonal peaks, to media companies and smaller sites that may need to handle a "Slashdot effect" when a larger website links to them. "Site owners tend to be overly confident that their site can handle expected traffic levels, which means the risk of crashes is probably higher than most of us think. In light of this, most organizations have had a web site for the past 15 years or so, and since the web is a truly vital part of modern business, it is remarkable that website performance is not given higher priority", said Ragnar Lönn, CEO and founder of Load Impact. E-commerce sites distinguish themselves from other types of sites in the survey. Among the top 100 sites surveyed, the largest e-retailers are on average investing three times as much on load testing compared to media sites, event sites and corporate/organization sites. "The report shows that e-commerce sites are most likely better prepared to handle heavy traffic during visitor peaks. They lose money immediately when the site becomes slower due to an increase in the number of visitors, so it is natural that they see a direct benefit of staying informed regarding the performance of their site. It allows them to optimize and plan ahead so they can cope with Christmas sales or other sales peaks”, said Ragnar Lönn. “It is a bit surprising that ad-funded sites, like many media sites, don’t seem to be equally concerned." When comparing different regions, North American companies invest the most in load testing, followed by South America and Europe. Asia/Pacific spends the least. The report “The State of Web Readiness 2012” measures load tests performed by companies and organizations all over the world. The overconfidence factor in the report indicates the number of concurrent users that effectively cause the server response-time to double from its initial level, compared to the maximum number of concurrent users the load test was configured to simulate. So an overconfidence factor of 3.4, as in this case, means the average load test was configured to simulate 3.4 times as great a load on the site as was required to achieve a 100% increase in load time. Load Impact is an innovative Swedish company with more than 10 years of experience in Testing & QA. Since 2009, thousands of satisfied customers and partners conducted more than 525 000 load tests using Load Impact's cost-effective cloud service. Load Impact now has a substantial customer base of over 35 000 active accounts that continuously uses the service to ensure the quality of their online presence. A load test identifies bottlenecks and problem areas which gives the customers the ability to timely adjust the appropriate resources and infrastructure before serious performance problems or interruptions occur. This gives customers the ability to provide an accurate, scalable and proactively optimized service to the end user. With the release of Load Impact 2.0, the next generation of enterprise-optimized on-demand services, the company has now strengthened its position as the world's leading provider of cloud-based solutions for web load testing. Load Impact is the most popular online load testing service on the Internet. It’s a true On Demand service, where you can start testing instantly and there are no licenses fees. You simply pay as you go. We provide load testing and reporting as an online service to e-commerce & B2B sites all over the world. These are powerful server clusters with very fast connections that are able to simulate tens of thousands of users accessing your website concurrently. Site owners tend to be overly confident that their site can handle expected traffic levels, which means the risk of crashes is probably higher than most of us think.